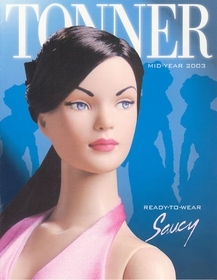 Small but beautiful collection was introduced mid-year 2003 featuring the Tyler Wentworth Reayd-To-Wear (RTW) with articulated bodies, different hair colors and eyes with forward glancing and side glancing eyes. Also offered was the RTW Boutique offering over 50 dresses, tops, sweaters, shoes, accesorries, etc. The catalog is printed on glossy, high quality paper - full of beautiful color photos of all dolls, outfits and accessories in the 2003 mied-year Tonner Doll Company collection including charming poses of the dressed and basic Miss America Collection plus several separate outfit sets; Tiny Betsy Gift Trunk Sets; Tiny Ann Estelle Collection; Tiny Kitty and Cloudland Play Dolls.